I just upgraded from 15.10 to 16.04 and also upgraded GNOME to 3.20 and my Google calendar isn't showing events & isn't listed in settings either. The Google account is set up correctly in Online Accounts and everything else integrates properly (documents, photos, contacts, files etc). Google Calendar not working with the GNOME Calendar 3.20 app is a bug with the GNOME3 Staging PPA, as reported by WebUpd8. If you want to use a more stable version of GNOME with probably fewer bugs, do not use the GNOME3 Staging PPA. search for "Private Address" on google agenda detail of your calendar and copy the link, than click on ADD on the ubuntu calendar and paste the click from google agenda. And job done. Not the answer you're looking for? Browse other questions tagged gnome 16.04 google calendar online-accounts or ask your own question. 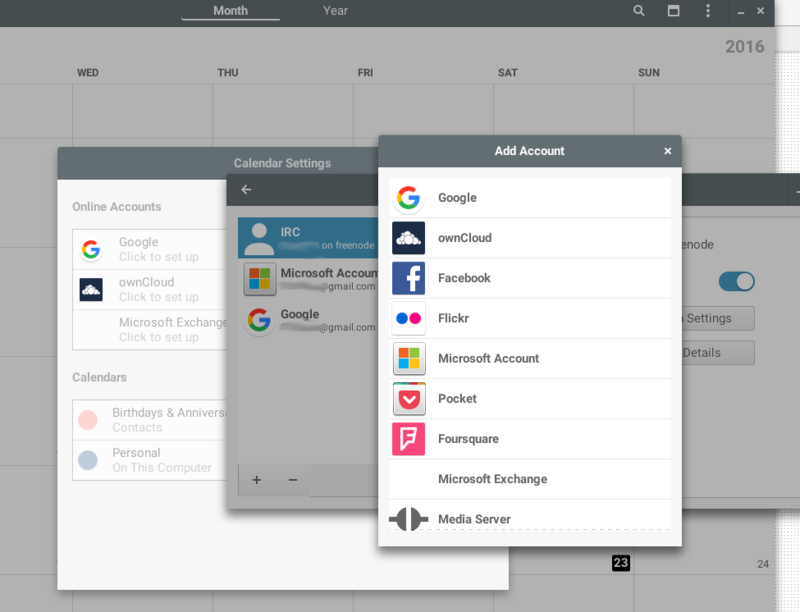 Which programs use the new “Online Accounts”? what are the “Online accounts” used for under System Settings? How to integrate google adressbook into contacts? How to set-up Contacts to work with Google Contacts?